The inaugural Formula E season has begun in fantastic style with close racing in each of the four rounds so far. As the championship nears the half way stage of its season, it is too early to tell whether it will be a long term success story. But how have things been doing on the broadcasting side? Interest was high for Formula E’s inaugural race back in September, with a peak audience of 477k (6.8%) for the live airing. When factoring in the evening highlights, this figure increased to 713k. A combined average of 426k dropped sharply to 160k for round two in Putrajaya, thanks to a clash with the Formula 1 season finale. Numbers have increased since then, however. 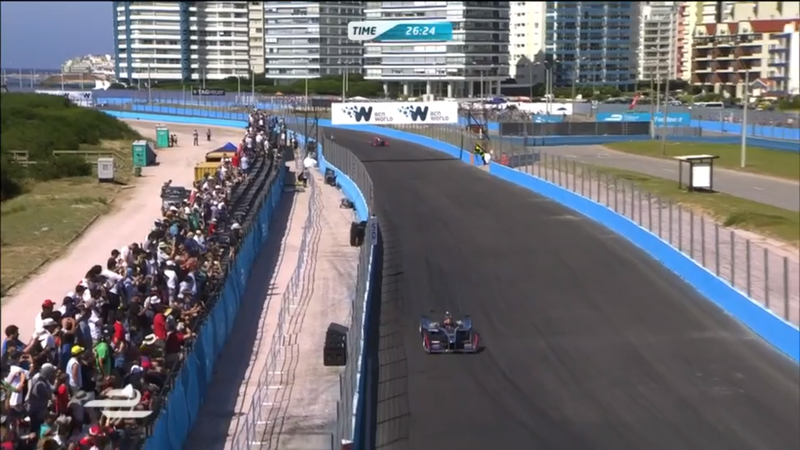 An average of 197k (1.1%) tuned into the Punta del Este ePrix, with 260k (1.2%) tuning in last weekend for the Buenos Aires round of the championship. The peak of 423k (1.9%) for Buenos Aires was still down on the figures recorded in Beijing. Highlights of both Punta del Este and Buenos Aires are not included, as the airings were next day and the figures for both were negligible. The increase in viewing figures is a good sign and one that should continue. Whether the figures are any good is a matter of opinion. I would have liked to seen both the Punta del Este and Buenos Aires figures to be higher given their primetime slot, so to see a peak of less than 500k could be construed as somewhat disappointing. The reaction from those that have been watching has been positive, so word of mouth hopefully will increase the numbers further. From ITV’s perspective, I think it would be great if the last three races this season were simulcast on their main channel. Monte Carlo, Berlin and London are all in mid afternoon slots, with no Formula 1 competition. Monte Carlo will be straight after the F1 Spanish Grand Prix Qualifying session and would be fantastic to showcase on the main ITV channel, Berlin will be two hours before The FA Cup Final, whilst I assume London will be live on-location. Last Saturday, ITV’s main channel hovered around 500k during the afternoon, and I have no doubt that Formula E would do better if promoted for the last few rounds. By broadcasting the last three rounds on ITV’s main channel, it would show that ITV Sport are committed to the series and want Formula E’s audience to increase further ready for season two. This point is absolutely critical. If Formula E is to be successful in the UK, it has to stay live on free-to-air television, I cannot emphasise that point enough. It can not be snapped up by BT Sport for ridiculous amounts of money. The first four Formula E rounds have been held in picturesque locations, which makes for great television. There is nothing worse than watching a motor race in the middle of the desert with only a handful of people there. The crowds seem vibrant and colourful, which makes for a better product on-screen. The team which organised the locations deserve full marks, because they have got things spot on so far. Compare the images in this article with any image from Formula 1’s races in Valencia or Korea, and they are a world apart. One of the many camera angles during the 2015 Buenos Aires ePrix. The direction for the most part has been good during the opening four races. There have been a few dodgy moments, notably during the pit stop sequences. 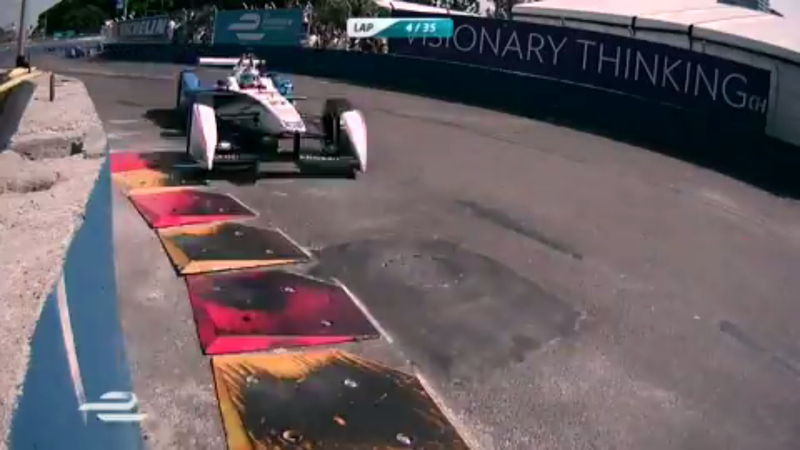 The pit stop sequence has probably been the weakest point of Formula E’s product. It doesn’t yet seem ‘fluid’ to me, the lack of on-screen graphics does not help explain to the viewer what is going on. I think they could do with a pit stop tower, like what we see in IndyCars, which they call the ‘race off pit lane’ to see how many positions car X has gained from the start of pit lane to the end of pit lane. One great point about the direction is that the cars look the part. They look fast. The reason for this is because the camera angles chosen have been simply fantastic, and make you feel ‘up close and personal’ with the action. The team have really excelled with the camera angles, and should be credited for that. The camera angles used in Formula E only serve to highlight the shortcomings of Formula One Management’s (FOM) on-screen product: in Formula E, the car is the primary focus, whereas you’re never quite sure with FOM whether its the Red Bull car or Rolex advert that is the focus. Concerning the music, I’m not too fussed with it now. I don’t feel like its been overused or underused, its use is just fine for me. Overall, Formula E has got off to an excellent start, with close racing combined with excellent commentary and stunning locations making for a great product on and off the track. I agree, it’s a surprise but I’ve really enjoyed the first 4 races. They sound like the Tamiya RC car I had as a kid but the racing is close and exciting, couple that with quality drivers that I follow and it’s off to a great start. Lots of empty seats, surprising when you consider lots of the tickets are free. And … Fan boost is a joke, the pit stops are a joke, the fragility of the cars is a joke, and the lack of laps in the race and lack of speed of the cars is a joke, and the lack of professionalism by the drivers leading to numerous rookie accidents is a joke, but as the series is firmly aimed at the under 12s all of the above has been well planned. i remember watching the start of the 1st race and just laughed at the music,no sound,lack of speed, pitstops etc but then i saw the racing and really enjoyed it. i have watched the other 3 races which have been fantastic with lots of close racing between well known drivers and action and now i really like formula e. yes there are a few little issues being a brand new series(schedule,penalties,fan bost etc) but the racing has been so exciting these things dont matter and im sure things will be tweaked . i think formula e has a very bright future. The last race was the first I had seen live. I thought it was great the only bad things in my opinion are the music played during the coverage and fan boost.